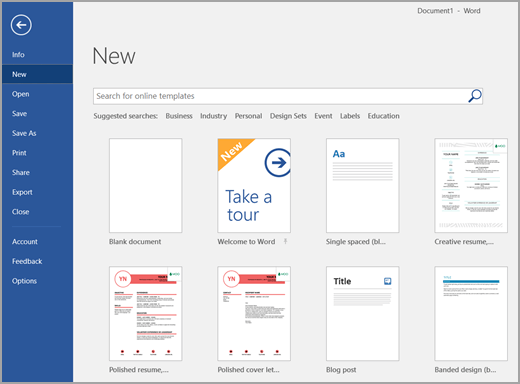 You can download free, pre-built document templates with useful and creative themes from Office when you click File > New in your Office app. Note: In Office 2007, click the Microsoft Office Button , and then select New. Templates can include calendars, business cards, letters, cards, brochures, newsletters, resumes, and much more. You can use any template you download as-is, or you can customize it to meet your needs. When you select a template you'll be presented with a dialog box that shows you a larger view of the template. To download and use it, click the Create button and a new file will be created for you, using that template, all ready for you to customize with your information. If you're looking to print on Avery labels you may find this article helpful: Print on Avery Labels with Microsoft Word. Tip: Looking for a large collection of great templates for Microsoft Office? Check out https://templates.office.com!